The rate of Consumer Prices Index (CPI) inflation in the UK fell to 4.8% during November, down from 5% the month before, according to the Office for National Statistics (ONS). The rate still remains well above the Bank of England's target of 2%. Retail Prices Index (RPI) inflation - which includes mortgage interest payments - fell to 5.2% from 5.4%. The fall was partly due to a slowdown in the rise in food and non-alcoholic drink prices. Cereals and bread prices fell by 1% in the month, compared with a 1.9% increase a year ago. Vegetable prices fell by 1% between October and November, their largest fall over this period for a decade. There was also a fall in the price of sugar, jam, chocolate and sweets. The ONS figures showed that slower rises in transport, clothing and furniture costs also contributed to the fall in CPI. "November's UK inflation figures provide further hope that inflation has now passed its peak and could soon fall pretty sharply," said Vicky Redwood of Capital Economics. She added: "There is still a lingering risk that inflation picks up again in December, but come January - when the VAT rise drops out - it should start to fall like a stone. "We still think that inflation will be below its target by the autumn, before dropping to 1% or lower." 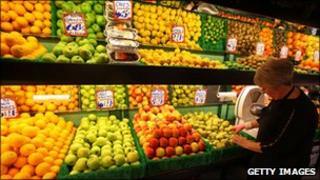 And David Kern, chief economist at the British Chambers of Commerce, said: "The fall in inflation in November was as expected, and will accelerate in the early months of 2012." But there were words of caution from TUC general secretary Brendan Barber. "Last month's drop in inflation offers some respite for people over the festive period," he said. "But with pay growth under 2%, people are still getting poorer and millions of families are facing a very tough Christmas this year. "It will take many more months of falling inflation, and far higher wage increases, before this long and painful period of real terms pay cuts comes to an end." The largest upward contributors to inflation in the retail sector were alcohol and tobacco. The ONS also said that prices of electricity, gas and other fuels rose at an annual rate of 20.9%, the fastest pace since February 2009. The Bank of England said earlier this year that it expected the rate of inflation to drop in 2012 as prices fall back and the impact of the government's increase in VAT is no longer felt. The Bank believes weak economic growth will push inflation below the 2% mark over the next 18 months. Data from the ONS last week showed that the rate of increase in the cost of goods being by manufacturers was also easing. The prolonged period of high inflation has made it difficult for savers to keep up with rising prices. According to the Moneyfacts financial information service, people would need to find an account paying 6% for their savings to keep up with inflation. "Savers continue to lose out to inflation even though the rate fell today," said Sylvia Waycot of Moneyfacts. "With returns so low and inflation unsteady, people don't know which way to turn."